Sabrina's birthday is coming up which is also when she has her dark baptism. During that night she must sign her name in the Dark Lord's book and from there will have to leave for a different school that will be focused on her witch powers. This means she must say goodbye to her loved ones, specifically her boyfriend Harvey and her friends Roz and Susie. 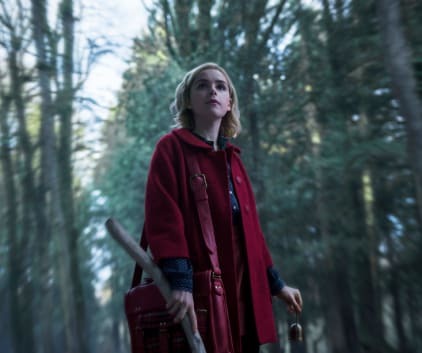 Sabrina starts to grow unsure, first because of the people she is leaving and later because she isn't sure she wants to give everything away to the Dark Lord. She focuses on starting a club at school before she leaves, one dedicated to women supporting other women. With the help of Ms. Wardell who Sabrina doesn't know has been killed and possessed by Madam Satan, and her cousin Ambrose Sabrina tortures her principal a bit to get him out of school so she could create the club. Sabrina also gets cursed by The Weird Sisters who don't want her going to their school as she is half mortal. This coincides with her trying to find a familiar, which takes the form of her iconic cat Salem. Sabrina tries to tell Harvey the truth, that she is a witch and she will have to leave, but it gets too hard and she wipes his memory. In the meantime, a boy is stabbed and Ambrose finds a witch mark that he thinks means that the boy was killed by a witch hunter. Aunt Zelda and Hilda aren't sure what to do, refocusing on Sabrina because they don't want to believe that a hunter might be in Greendale. Still unsure what to do, Ambrose advises Sabrina to go to the oldest tree and it will gift her with knowledge. She gets transported into a terrifying, dark, and very red hallucination that gives her her unknown decision. She also gets chased by a possessed scarecrow that Madam Satan sends her way, only to be saved by Salem. Sabrina comes home to tell Ambrose and her aunts what she decided, but Father Blackwood is there to try to convince her to go through with her baptism. Sabrina: I'm leaving my girlhood behind. Permalink: You're only supposed to start missing things after you've said goodbye to them, right?